On a blustery, cold Halloween night, a wicked witch fretted in her brand new house. She had just re-married, blended her little goblins, and moved her in-home preschool to their new location. She was overwhelmed and cranky (nearly flipped lid), but still wanted to create the "Perfect Halloween" for her children. The lovely witch followed the trail of shimmering blue make-up up the stairs, down the hall, and into the master bedroom and bath where her little darlings were making faces in the mirror and squealing with delight at how scary they looked in their costumes and made-up faces—until they saw the contorted look of horror on the mother Witch's face (fully flipped lid). Their joy suddenly turned to sheer terror (mirror neurons at work) as their once friendly Mother Witch turned on them. She started screaming at the top of her lungs "WHAT HAVE YOU DONE!?! (Blame!) YOU'VE RUINED OUR BEAUTIFUL HOME!! (Priorities?) AM I THE ONLY ONE WHO CARES ABOUT HAVING A DECENT PLACE TO LIVE!?! (Not really a Curiosity Question.) DO YOU WANT TO LIVE IN A PIGSTY ALL YOUR LIVES!?! (Shame.) YOU DON'T DESERVE TO GO TRICK-OR-TREATING!! (Punishment) GET OUT OF HERE!! (Abandonment.) YOU CAN JUST GO OUT TRICK-OR-TREATING BY YOURSELVES. The wicked witch was out-of-control! After she chased them down the stairs, she saw more of the ugly blue stain on her living room and dining room carpets!! She screeched some more hurtful things at the innocents and pointed her bony finger towards the door. (Not a very respectful way of using NON-VERBAL SIGNALS.) The little children and their friend (humiliation) cried in fear and ran out of the house—to the streets of a brand new neighborhood where they had only lived one week. A few minutes later the wicked witch realized what she had done and felt great remorse and shock at the way she had treated her little children who just wanted to BELONG. She jumped on her broomstick (a big Suburban) and raced down the street trying to find them. Ahhh . . . Great Relief! There they were—safe on the sidewalk. Whew, they had not been kidnapped! 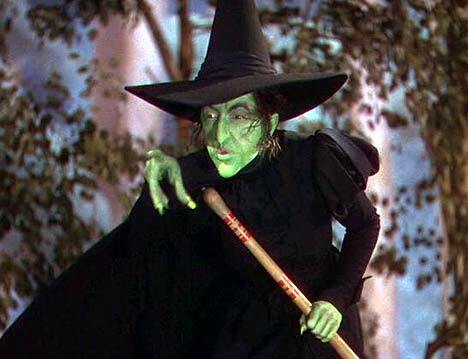 After many tears and hugs, the Not-So-Wicked Witch took responsibility for what she had done. She shared with them what she had learned from this experience, and what she would do differently next time she was that stressed. (5 Rs of Recovery.) She let them know that they were more important than a few stains on the carpet— and it could be cleaned up, anyway. Fortunately, her loving children were amazingly forgiving and eventually recovered from their harrowing ordeal with the Wicked Witch of the West. However, to this day, none of the girls will wear Halloween make-up. It warms my heart to hear Positive Discipline success stories. I know other parents find them them helpful and encouraging too. I asked for permission to share Laura Beth's and Jake's story to inspire others. My son, Jake, 3-years-old, loves to help out with projects like these. We have done a behavior chart before (it turned into a piece of art on our fridge instead of a teaching tool!). 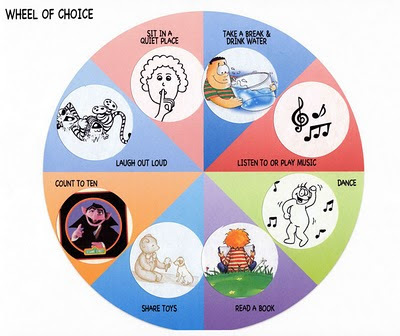 However, the Routine Chart and Wheel of Choice have been very successful in our home. 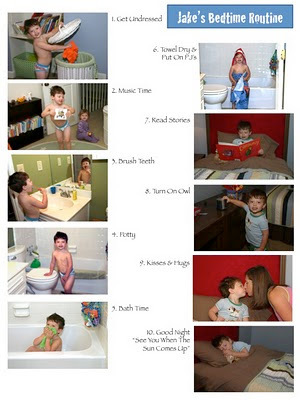 Even though he always knew his routine before bed, having a chart has made it fun for him, PLUS he gets to look at himself in the pictures he took! We walked through his routine together before snapping photos of him doing it all! He is proud of the chart, shares it with anyone who comes into his room! He has been using it for about 3 weeks and he doesn’t forget a step! The Wheel of Choice was fun to put together too. I asked him what he’d like to do when he’s feeling frustrated or sad or hurt... And he proceeded to tell me he’d rather laugh than cry; he likes to “take a break and drink water”; dance; etc. He got into the actual searching for pictures that described the words and the outcome is our Wheel Of Choice. We used it today, in fact, when he and his sister (Marin, 17 months old) were sitting on the sofa sharing a book. Marin, took the book and Jake immediately flipped his lid. Yelled at her, grabbed the book, made her cry, she grabbed it back and I slowly walked in. I asked Jake if he’d like to use his Wheel Of Choice to help – and he actually said YES! He chose to “share his toys,” he got Marin her own book that was more appropriate for her and she gladly gave him his book back. They sat there for a while and then traded!! I am continually awed by the passion and commitment of people who want to become Certified Positive Discipline Trainers. Asma Saloom recently sent her "Letter of Intent" to join the PDA training program. I was so touched and impressed that I asked for her permission to share parts of her letter. Asma is planning to take Positive Discipline to Egypt. Becoming a mother three years ago was a turning point that helped me discover what I want to do in my life: work with children and provide them environments that support cooperation, mutual respect, and contemplation. I had not been around many children before and had very few expectations or assumptions about what conventional parenting or discipline is supposed to look like, so entering this new role with the need to “research” how to do it opened my world to a variety of philosophies about raising children. My firm belief in the need to respect and honor the child as a capable member of the family and society led me to read about Montessori methods and Positive Discipline, which I first heard about in my natural birthing classes. I found these practices to be really comprehensive and life changing because they result in such a heightened awareness of the importance of the words, actions, and environments that our children encounter. We can support our children as they develop themselves, or we can make them think that nothing matters more than what we and others think of them. We can help them become strong, curious, and self-reliant, or we can crush their spirits so that their highest aspirations are to follow the crowd. It’s such a huge responsibility. As a mother, I use Positive Discipline with my children because it respects the child while fulfilling the parents’ needs. The successful family needs cooperation from all of its members, and Positive Discipline teaches us how to achieve true cooperation rather than the appearance of cooperation through coercion or bribery. Everyone’s needs are honored and their contributions are valued. As an elementary teacher-in-training, I plan to use positive discipline in the classroom to help me actualize my ultimate goals for working in education: providing a supportive and respectful environment in which children are not “controlled” but rather learn to become positive and self-driven contributors in the learning community as well as the greater society. The idea of controlling children is so ridiculous and impossible, and even if or when it does work, it leaves them with no internal regulation to help them function when they are alone. So when will they learn that they are capable of being responsible and regulating themselves? Trying to control children does such a disservice to their development into thoughtful adults. I recently decided that I wanted to take my practice and understanding of positive discipline to the next level by becoming a trainer, so that I will be better equipped to share it with others and ultimately lead workshops for teachers and parents.